Today, the design team over at Stylin’ Scrappin’ Inkspiration decided to do a post sharing ideas using the upcoming Sale-a-Bration items (if you have no idea what that means, Stampin’ Up has a promotion every spring – this time starting January 28th – where for every $50 you order, you can pick any item in this special catalog to get free with your order; which is what we are playing with today!) And since I wanted to play along, I dug through my limited stash of Sale-a-Bration goodies to come up with a fun project to share. 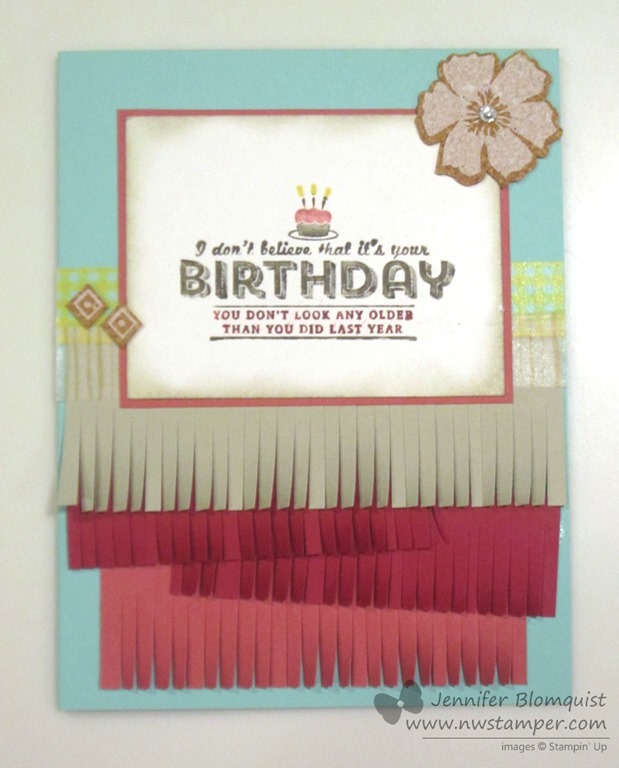 It all started with the pair of fringe scissors on my desk and a vision of this super duper great fringed card that my downline, Stacey shared in our team facebook page. I took the inspiration of layered fringing and started grabbing what was lying around on my desk. And the plan to use my fringes to cover it up… because darn it… it is still a totally usable card base! So, I grabbed some scrap paper and started cutting and layering. Then I needed something for the top – so Washi to the rescue! Yup, I used the Gold washi tape and the Gingham Garden washi tape. Mix and match away! Where is the Sale-a-Bration stuff you ask? All in the top of the card! First up, the super cute sentiment from a new See Ya Later stamp set (and yes, it has a sentiment that says “See Ya Later, Alligator”! I had to color it in with markers because, well, I just did. And then see that flower and those diamonds? More SAB goodies! These are the Sweet Sorbet self-adhesive cork embellishments. I will warn you – this isn’t your kiddos adhesive. I stuck one of those diamonds down and when I decided I wanted to move it, it was NOT going anywhere! I had to carefully slice it out of my card using scissors to get it to move. So, word to the wise, they are great embellishments, just make sure you have it where you think you want it before pushing it down. So, if you saw my blog post from yesterday, I shared a card that used the Oval Framelits to cut out a frame to highlight some vellum in the center of the card. The frame effect was really cool, but I was left with two, pretty big ovals when I was done. Wanna see what I did with them? …. never to be used again! So, I’ve made it a new rule for me. If I want to keep a punched/die cut/stamped scrap, I need to use it right then (or pretty soon to right then) otherwise it goes in the recycling bin. And create I did! 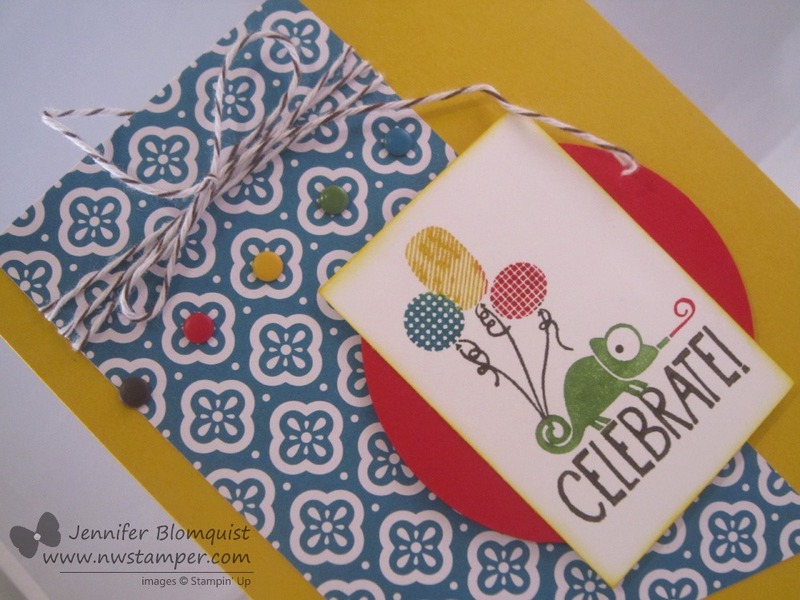 I used the two ovals as backgrounds for the card and then started layering elements on top. I grabbed the new Naturals Chevron ribbon and then to spice it up, I tied some linen thread around the top and frayed what was above the thread. Also, if you look close…. 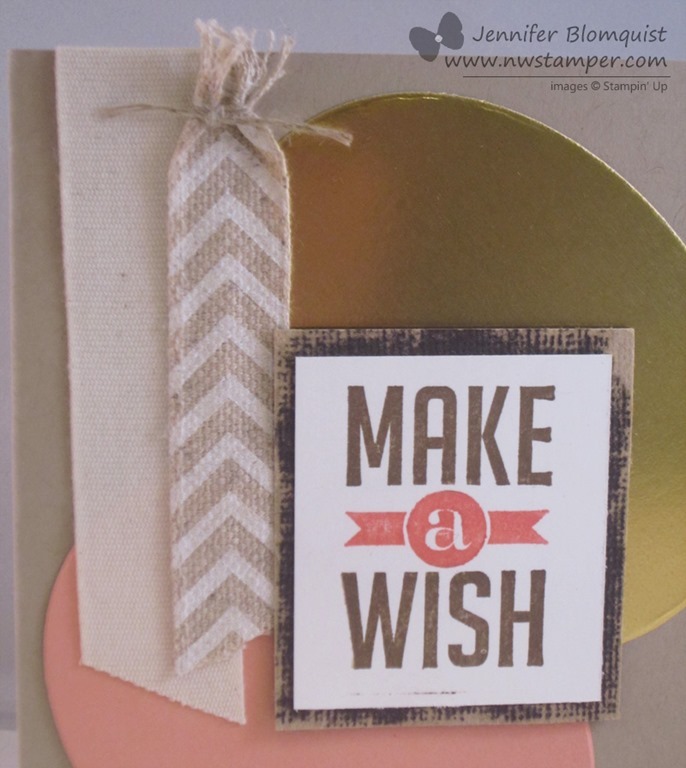 you can see that the party hat in the lower right hand corner is fussy cut and glued onto the card front. Wanna know why? 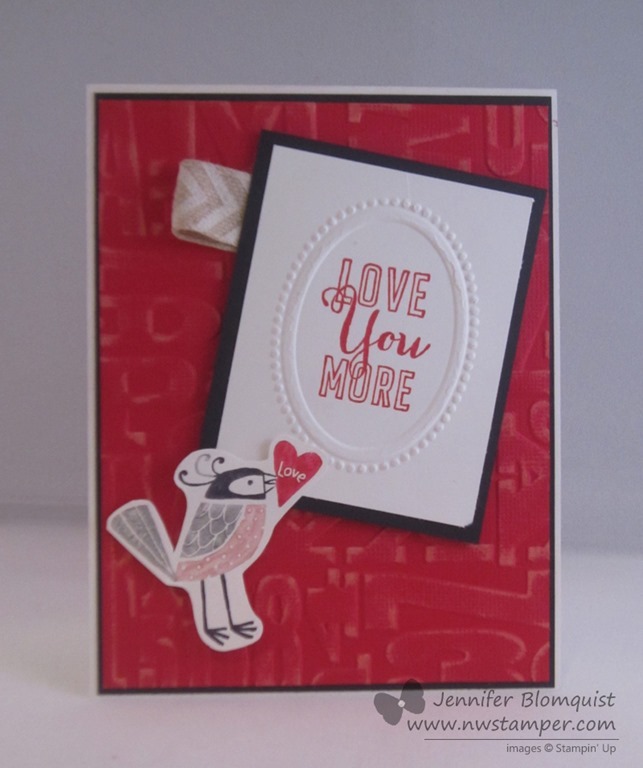 Because I was too chicken to stamp directly on the cardfront! Ha ha, it’s true! I thought the card needed something and I thought the hat would look good in the corner but I didn’t trust that it would really work out. And since everything else was already glued down, I just stamped on a piece of the same Crumb Cake paper and cut it out. Turns out I liked it so I just glued it down as is! I love how it turned out and I hope it gives you ideas as well! Have I mentioned that I’m finally falling in love with this Gold trend? When I had a chance to sit down and play with my new stuff for an afternoon recently, I found that I kept reaching for my Gold Foil paper or the Gold Vellum. Given that this is the girl who ALWAYS prefers silver to gold and practically never wears gold anything… this is HUGE! I was very lucky to have been given this stamp set as a gift over the holidays. I had actually seen the rubber for this set in the production line when I was in Kanab in September for Founder’s Circle and just LOVED the mustache, the I do with the “o” being a ring, and the people (aka – bathroom people I’ve heard them called). See… kinda fun, right? So, I just had to play with it and I got in the mood to try out my Oval Framelits as well. Yes, I know they aren’t new-new, but they hadn’t come out of their packaging before in my house, so they were novel to me! I tried this idea of cutting out the ovals to make a frame and then mounting the gold heart vellum to the backside of the frame. That way, I could have my vellum and not have to worry about edges or how to glue it down. 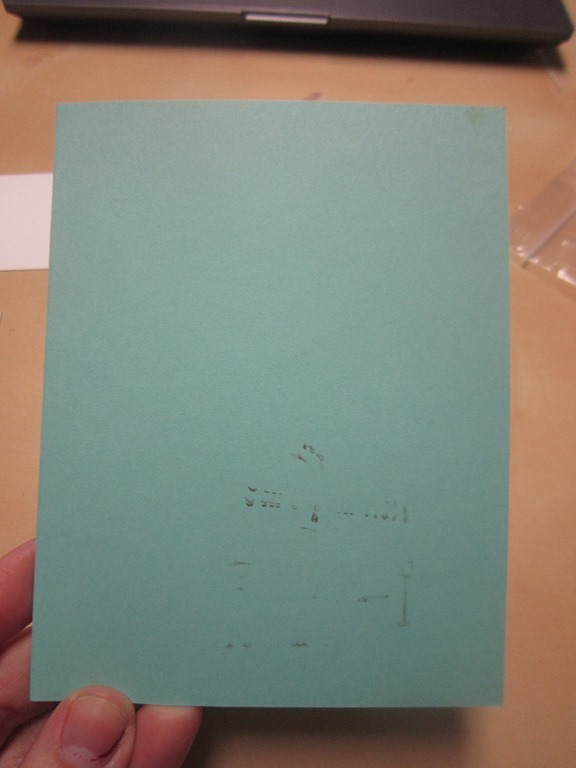 Plus, in this case, I actually like the embossing that sometimes gets left behind when you cut out with a framelit. It adds FLAIR! 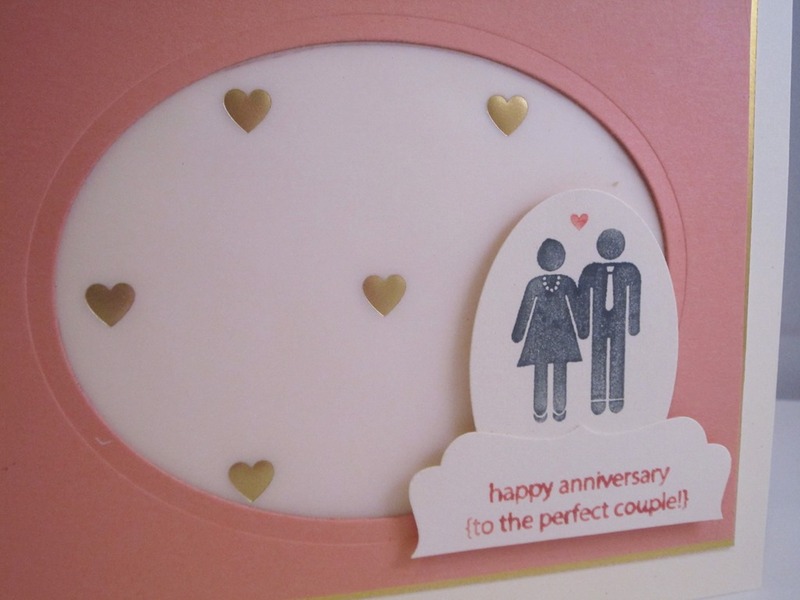 Then just stamp and punch out your people and it looks like a fun cake topper from their wedding. Anyone else see it? And, yes, this leaves you with big ovals left over from the gold and the Crisp Cantaloupe cardstock, but I’ll show you tomorrow an idea for how to use them! So, make sure to stop back by! Oh hey! 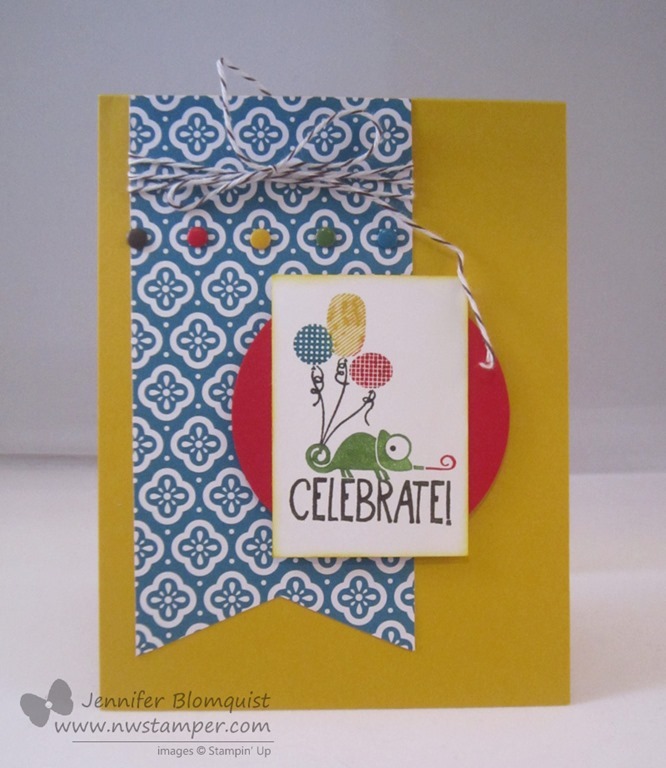 I just saw that one of the Weekly Deals is the oval punch I used in this card. How snazzy is that? So, if you don’t have it, know it goes great with the couple stamp and you can get it for 25% off this week. 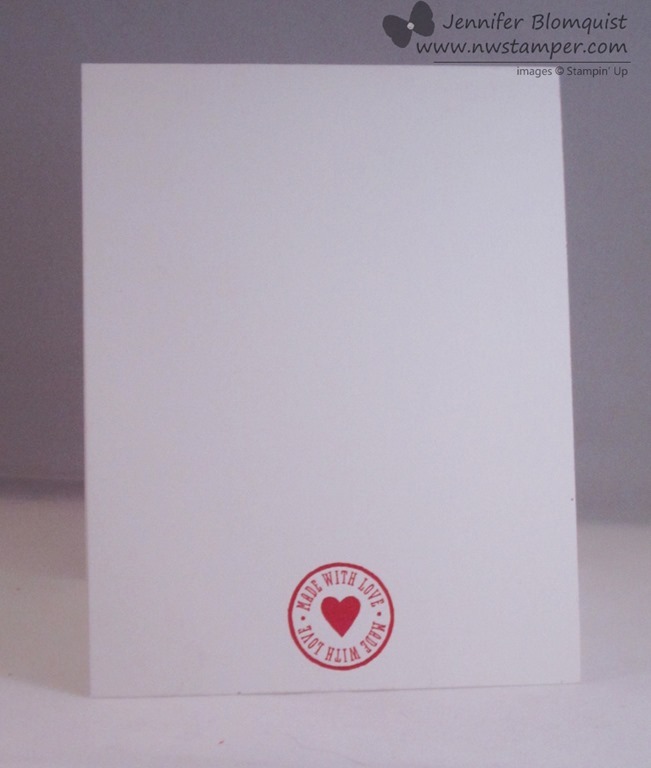 I even broke out the Alphabet Press embossing folder (on sale this week with the weekly deals!) for the background. I’ve had this folder for a while but keep forgetting to try it out. Doesn’t it sand awesomely? 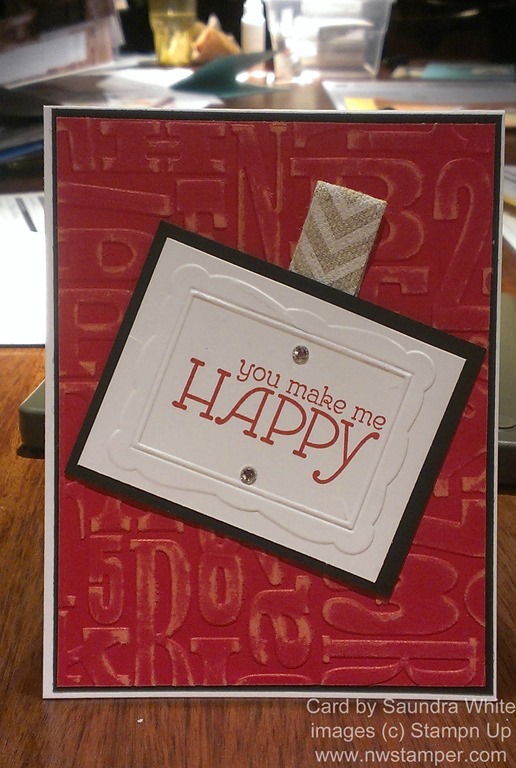 And for the finishing touch, I just had to use the “Made with Love” sentiment from the same set to complete the card by stamping it on the back. Just a reminder, if you love this set, it is only available until January 27th. It’s not in a catalog but you can find it in the Valentine’s Product’s section in the Online Store. 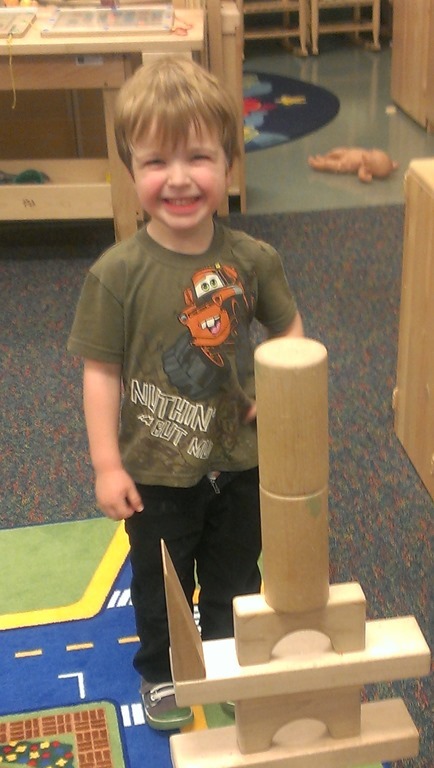 Earlier this week, Nicholas (my now 4yr old) had the chance to celebrate his birthday with his Preschool class. It’s a special circle time they call a “Birthday Circle” and they all sit around and the birthday child can have mom/dad/siblings come in for the circle while they share photos or something special about each year the birthday child lived. And treats…. we “get” to provide treats. Isn’t that lizard so adorable? So, I sat down the night before (at 10:45 pm, talk about last minute!) and started coloring this one stamp from the Tag It stamp set with my markers so I could stamp 18 of these guys for the treats. Then I cut each of them out using the coordinating Chalk Talk framelits…. oh and adding the tag hole from the same framelit set. Do a little sponging and then just the right twine to tie them off. I got them all ready and sent them in to school, but then I figured the teacher needed a little thank you as well, so I had to make a card for her too using the same theme. You know everything has to be coordinating! 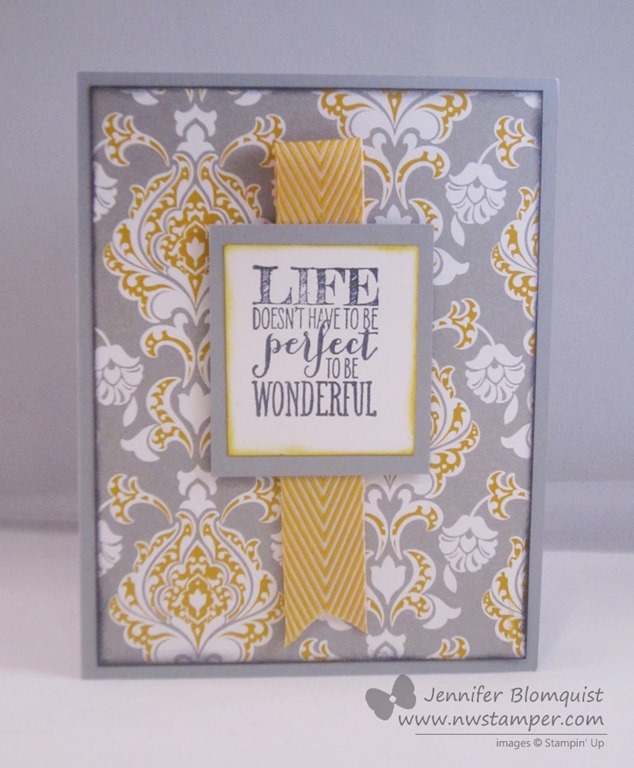 Same idea but just a little mixing around of extra accessories and embellishments to turn it into a card. I needed some bright paper to match the bright colors in the stamped image (I got lazy, no tag this time) and and then the AWESOME candy dots to break up the pattern of the paper and tie it into the birthday image. So see, it is like a coordinating set! So, don’t forget to try something simple and cute when you need a treat for something. 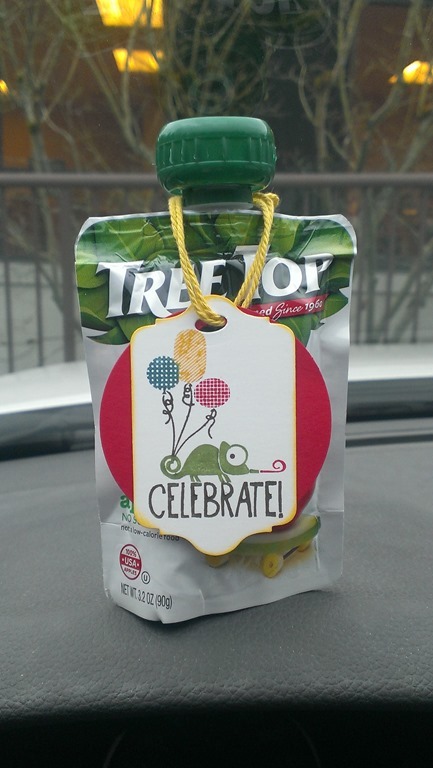 It doesn’t have to be complicated to be fun and appreciated by the recipients… even if they are 3 yrs old! 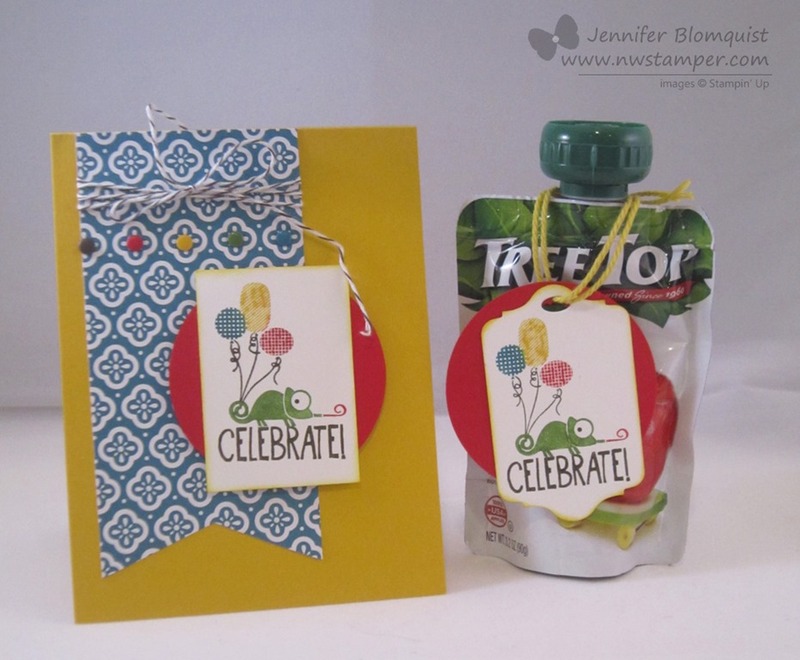 Want to see more great Birthday Card ideas? 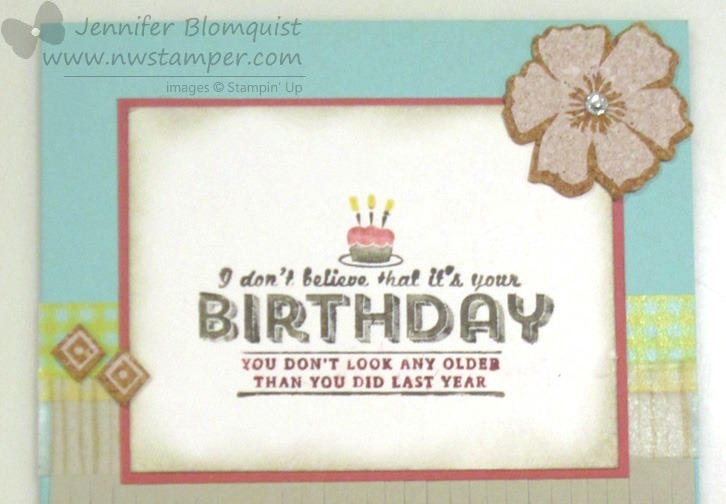 Today over on the Stylin’ Stampin’ Inkspiration blog, we are sharing different Birthday card ideas. This was mine, but there are lots of other ideas and variety to check out. So, hop on over and see what other cute ideas you can try. I needed a quick card recently and I felt like I was getting into a rut with the layouts I had been designing so I started flipping through my designer paper and tried to find a design that called to me. In the end, I decided to play with the Eastern Elegance designer paper. 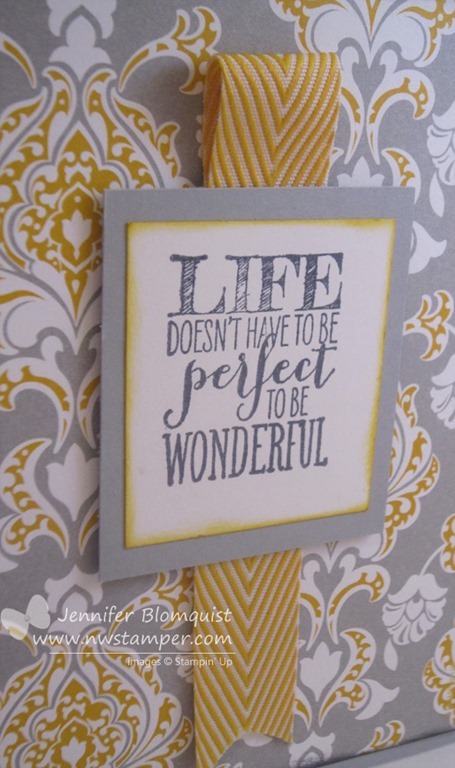 I love this sentiment from the Perfect Pennants stamp set. Isn’t it so true? The layout turned out super simple – and quick to make again with different colors and paper patterns – but it is nice to let the pattern from the paper do a lot of the work and be the perfect tone for whomever you are sending the card to. Now I need to go try out this layout again with different paper and see how it turns out! I’m trying to get back in the swing of things and thought I’d share the card I created for a couple swaps I’m in. 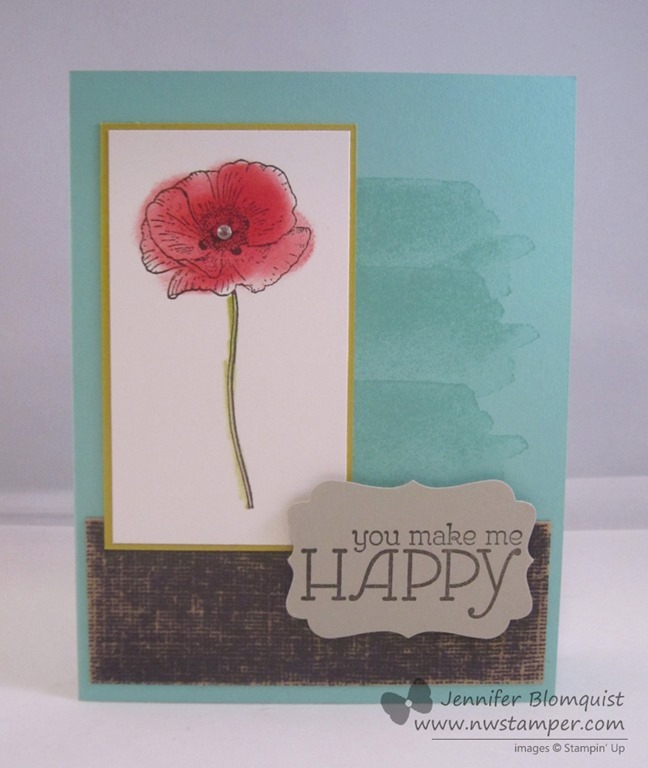 I loved this Happy Watercolor stamp set and thought I’d experiment with some different color combinations. I think they work surprisingly well together! 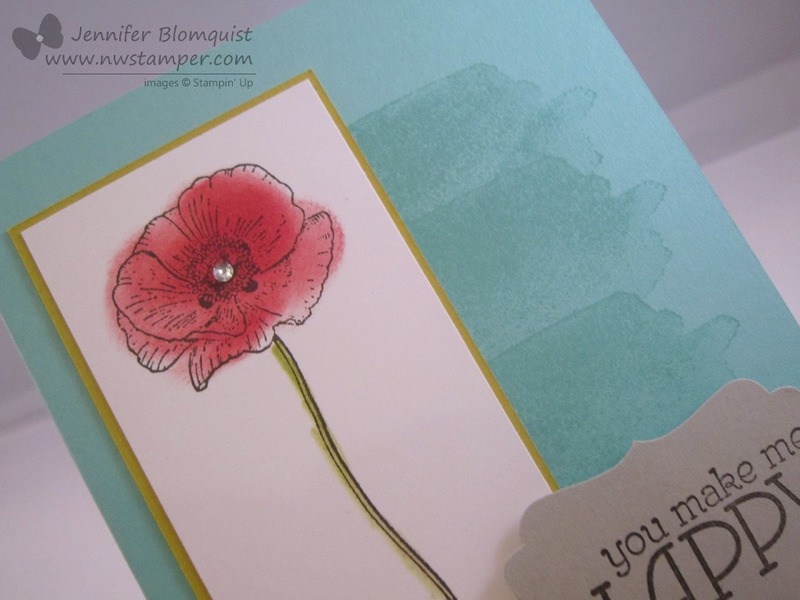 For the flower, I did a different type of coloring… I used my sponge dauber! I just dabbed it in the Real Red ink pad and then swirled it over the flower to color it it in. It make for an imprecise coloring effect but I think it works great with this particular set. I had fun making it and think we’ll make it as a group at club this month! So, I hope my club gals love it too! Interested in joining a stamp club? I am kicking off some new clubs this year including long distance/virtual clubs and local stamp clubs. Get project instructions and completed cards sent to you each month or get the kit to complete with me or at home! You just commit to ordering $25 each month you are in the club and have the opportunity to be “hostess” for one month and get the hostess benefits too! Email me at jennifer@nwstamper.com for more details if you are interested! 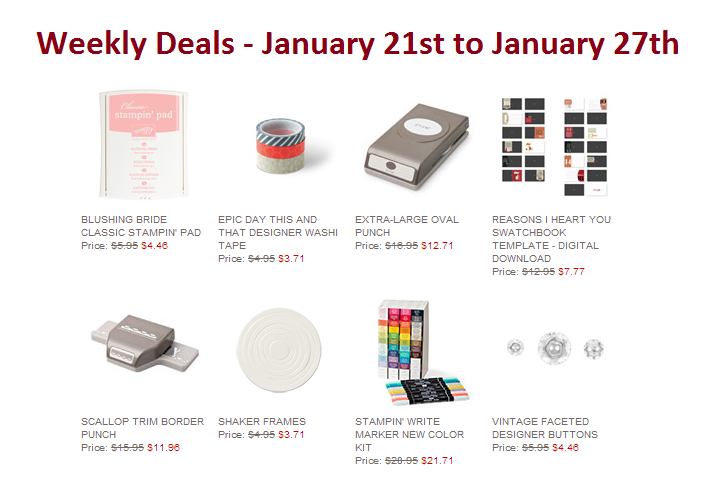 Did you catch the weekly deals? Yep, they are still going! See the latest specials here.